Minister of Finance Bill Morneau speaks with the media in the Foyer of the House of Commons on Jan. 31, 2019, in Ottawa. The parliamentary budget watchdog is projecting the federal deficit this fiscal year will come in $2.1-billion lower than the Liberals have predicted. Yves Giroux’s office chalks up the change to higher-than-anticipated income-tax revenue that the government has collected this fiscal year, which closes in March. A report out this morning from the Parliamentary Budget Office predicts that this year’s budget deficit will be $16-billion, less than the $18.1-billion the Liberals anticipate. 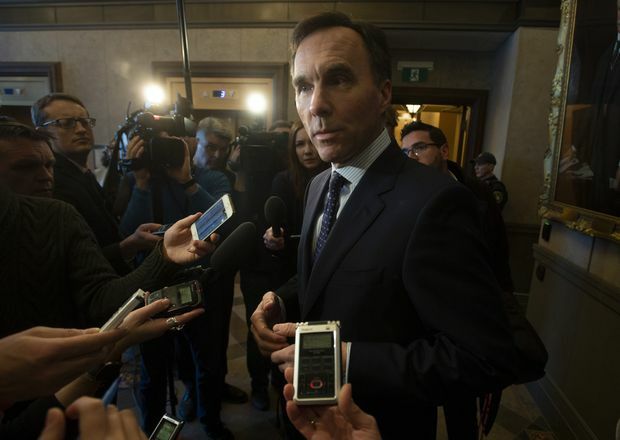 Had the economy been weaker or tax revenue lower, the report says, the federal deficit for the 2018-19 fiscal year could have hit $23.2-billion when taking into account extra spending in Finance Minister Bill Morneau’s fall economic update. More than half the $7.2-billion swing in the projection is owing to stronger tax revenue than Mr. Giroux predicted in the fall. The report says corporate income-tax revenue is $3-billion higher than the watchdog forecast in October.